A really easy, pretty, appetizer that is perfect for vegans, vegetarians, gluten-free, and healthy eating. These are like little mouth explosions! Add the avocado, basil, nutritional yeast, lime juice, garlic and salt in a food processor or blender. Blend until smooth stopping to scrape the sides as needed. Use a mandoline or potato peeler to cut long thin strips from the cucumber. Take a cucumber strip and spread a thin coat of the avocado mixture along the length of the cucumber. A little goes a long way! Make sure to get some avocado all the way to the end, so it will stick the roll together. Roll it up! No toothpicks needed. 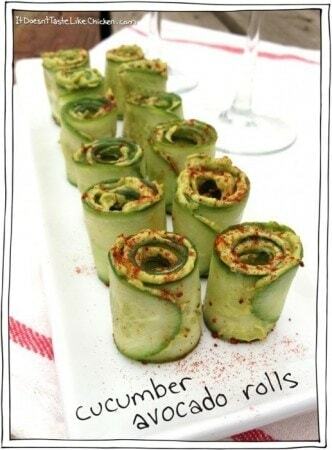 Do the same with the rest of your cucumber strips. Sprinkle with a little paprika and serve right away. Cucumber is watery and softens quickly, so if you plan on bringing these to a party, prepare the avocado spread that morning, and store in an air tight container. Bring a whole cucumber and potato peeler and assemble at the party.